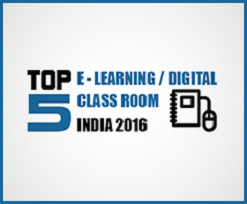 Learnnovators, a leading provider of innovative e-learning solutions, has been featured among the ‘Top 5 E-Learning/Digital Classrooms in India 2016’ report by SiliconIndia, India’s largest community of technology and business professionals. Education in India is taking giant leaps forward, both in terms of pedagogy as well as the technology used for imparting learning. Scores of digital learning solution providers have started offering services that leverage technology to create an inclusive learning environment, helping companies achieve greater efficiency and ROI. On these lines, SiliconIndia has carried out well-grounded research (conducted by their editorial board, along with a panel of the industry’s leading CEOs, CIOs, and analysts) and come out with the list of top 5 companies who offer e-learning / digital classrooms. Coming from a trusted and respected brand like SiliconIndia, the list is intended to help organizations in selecting a partner for their learning requirements. “Being included in this prestigious list is not only a huge achievement, but also a great responsibility. We intend to take this honour very seriously and provide nothing less than the best, and the most innovative, of services to clients”, says Ravi Pratap Singh, Co-founder of Learnnovators. Learnnovators is a multiple-award winning organization that specializes in the design and development of innovative and effective learning solutions for the workplace. The company helps clients address skill and performance gaps in their workforce by creating customized learning solutions that are aligned with their business goals. Whether it is choosing the best mode of learning techniques tailored to organizational objectives, or creating customized content, or designing interactive modules with the help of games or simulations, Learnnovators has implemented innumerable programs to the satisfaction of a global clientele. These solutions have been deployed on a variety of contexts and devices, such as mobile phones, tablets, interactive white boards, interactive kiosks, etc. Learnnovators has also crafted several just-in-time, micro-learning modules and performance-support solutions for their clients. Learnnovators’ core competencies are in the areas of Custom E-Learning, Rapid E-Learning, Mobile Learning, Gamified Learning, Blended Learning, and Localization. It also offers its own learning platform, Learnosphere. To know more about the company, please visit Learnnovators' website.